One of the most successful and distinguished artists of our time, Andrew Lloyd Webber has reigned over the musical theatre world for nearly five decades. Winning numerous awards including multiple Tonys, Oliviers and an Oscar, Lloyd Webber has enchanted millions worldwide with his music and his shows. In Unmasked, written in his own inimitable, quirky voice, he takes stock of his achievements, the twists of fate and circumstances that brought him success and disappointment, and the passions that inspire and sustain him. Although the musical in its original 22 minute form first took to the stage in 1968 at Colet Court School in London, the Lloyd Webber name was most likely first heard of here in South Africa in 1974 with the first production here of his and Tim Rice’s iconic Joseph and His Amazing Technicolour. With this introduction, Andrew Lloyd Webber reveals a glorious sense of humour which he unleashes throughout this remarkable memoir. Covering several exciting and turbulent decades of musical theatre and the transformation of music itself, the book is a chronicle of artistic creation. Lloyd Webber reflects on some of his most famous productions and his collaborations with luminaries such as Tim Rice, Robert Stigwood, Harold Prince, Cameron Mackintosh and Trevor Nunn. Taking us behind the scenes, he reveals fascinating details about each show, the rich cast of characters involved with making them, and the creative and logistical challenges and artistic political battles that ensued. The narrative takes one to both sides of the Atlantic and the subtle differences between their audiences are most interestingly detailed. Much like when enjoying a glass of wine, and acknowledging its grape variety, area of origin, winemaker etc., gaining an appreciation of the challenges involved in conceiving and staging a stage musical, as one does in this book, is a tremendous value add for lovers of musical theatre and audiences alike. Having seen and thoroughly enjoyed the original London productions of both Jesus Christ Superstar and Cats, I found the chapters on their gestation fascinating. Cats in particular was a production that I will never forget. Remembering the production as a whole and its unique and spectacular stage setting still sends shivers of excitement down my spine after all these years. The last few chapters of Unmasked, as seems far too common with many autobiographies, seem a little hurried. Maybe Lloyd Webber was aboard the Starlight Express, or had a submission deadline looming from his publisher? There are other parts in the book that too suffer from an overdose of “speed”, but this is not a criticism merely a frustration. The three big discoveries for me from this book were his oft self- deprecating wit (I find what I’ve seen of him on television ’terribly’ serious), his passion for architecture and that he is a foodie. All three subjects add further interest to an already full and rewarding “showbiz” memoir. Andrew Lloyd Webber was knighted in 1992 and received a peerage in 1997. His work has garnered amongst others, six Tony Awards, three Grammy Awards, an Academy Award, seven Olivier Awards, a Golden Globe Award, and a 2006 Kennedy Center Award. He also has a star on the Hollywood Walk of Fame, is an inductee into the Songwriters’ Hall of Fame and is a Fellow of the British Academy of Songwriters, Composers and Authors. 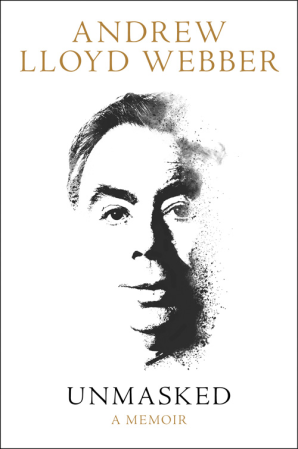 With a remarkable career like Andrew Lloyd Webber has enjoyed, Unmasked cannot but be an excellent read. Add to that his erudition and superb sense of humour and you are in for an entertaining and informative ride. Some might find too much space and detail being given to the business side of his work and to some of the technicalities of mounting a production, but they are a necessary and valuable part of the whole. Unmasked is nearly 500 pages, and I found every page of it totally absorbing. There is so much more to the Andrew Lloyd Webber story waiting to be told. And his creative juices are not lying dormant: He deserves the highest appreciation not for his ouevre alone, but also for his herculean efforts to keep theatre and musical theatre alive and well. As at theatre lover, I for one doff my hat to him. Luckily, there is an allusion that this Phantom of the Opera-ending volume will have a second tome. Yes please Baron Lloyd-Webber, please raise the curtain soon, your reading audience is waiting. 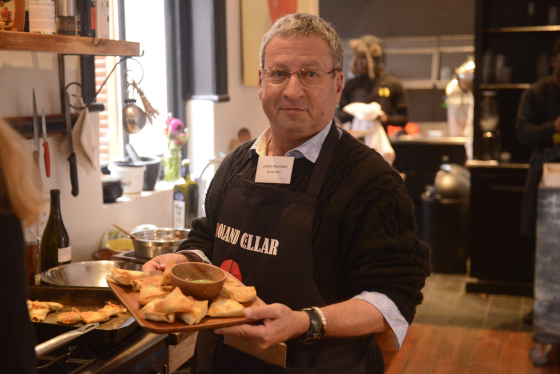 Julian Richfield is a former Public Relations Consultant who, since retirement, continues to use his writing skills as a wine writer and book reviewer for The Cape Times.